Kris Kristofferson is releasing a new album soon. There hasn’t been much publicity about this, yet this news is of great interest to me & any of his fans. I have tried to piece things together from information which has been made available to the public. You just can’t believe everything you read on-line these days. During his long music career, this artist has covered topics from peace to war, freedom to incarceration, love to loss & every wonderful & mean thing in between. Many of us grew up & are now growing old with him & his talent. At different times in his life he has fought privilege, poverty, addiction, depression, excess, conflict in himself & the world, & he now battles memory loss. Despite this, he regards himself as blessed, happy & lucky in life & love. So is there a new album in the pipeline? 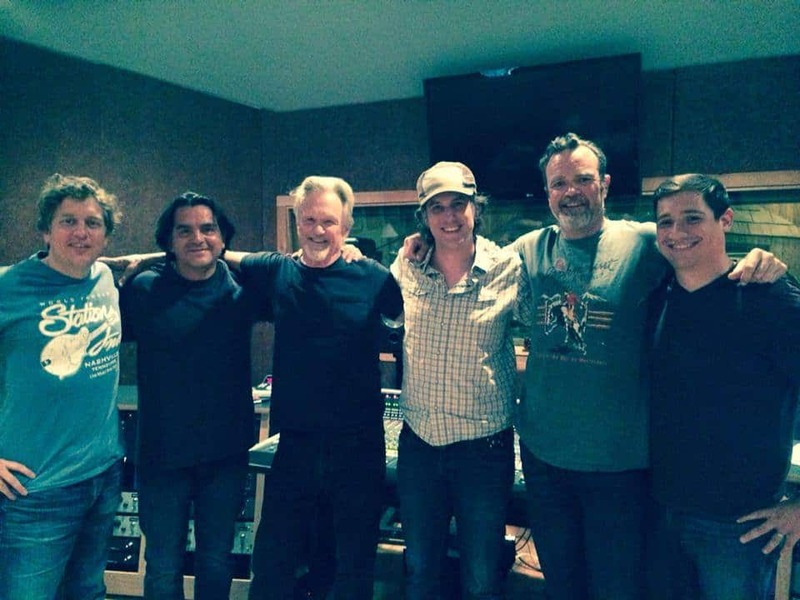 On 26 June 2014 Cedar Creek Recording posted a shareable group photograph to their Facebook page that shows Kris Kristofferson outside their studio. From this photograph, (below) I am guessing that much of the recording for the new album was done then. While Kris is not one of the listed artists on this site, browsing the media videos shows Lance Canales & the Flood singing Woodie Guthries Plane Wreck at Los Gatos (Deportee). This song has been covered by many artists, & the list includes people who either performed with, are friendly with, or respected by Kris. People like Joan Baez, Dolly Parton, Bob Dylan, Arlo Guthrie, Bruce Springsteen. Perhaps more telling, the song was included in the set when Kris himself toured & recorded with the Highwaymen. Having been alerted to this interview by a member of a Facebook Group called I love Kris Kristofferson which includes a lady who is Kris Kristofferson’s Biggest Fan (in all but stature! ), I set about checking whether this report was true. If so, then the news had been delivered with the humility & understatement & honesty that fans have come to expect from Kris over the years. I must have read it a dozen times before the news sunk in – Kris is releasing another album. Let me repeat, KRIS KRISTOFFERSON IS RELEASING A NEW ALBUM! Q: So if you were to record again, what would you do? Have you talked with (longtime producer) Don Was at all? A: Yeah, we’ve done some stuff together, and (consults Meyers) my wife says I have an album coming out called THE CEDAR CREEK SESSIONS. It’s some older songs and some new ones, and I recorded it in Austin. Just when I thought I had heard it all there was to hear, I now feel like I did as a teenager waiting for my pre-ordered new LP to arrive at the record store. Little more was said about this album other than it will contain some new material along with some older songs, so I, like you, will have to wait. Wait & hope that maybe, just maybe, there might be another UK tour in the future. I do hope that the new album was recorded at this studio. It looks & feels special – Intimate & non-conventional. The sound that has comes out of it seems perfect based on recordings made by other artists, & I like to picture Kris recording in a space where he feels comfortable & at home. Take a look at this Steve Devine / Austin Blues video & see what you think. Let me know your thoughts? Long may Kris kristofferson strum.